Our outlook at the start of 2018 is pretty similar to the one we had at the start of 2017. We know that equity markets have come a long way since the lows of 2009 and we know that we are probably nearer the end of the current economic cycle (which is now over seven years old) than the beginning. On the other hand, we also know that the economic picture remains strong and that large losses in equity markets normally coincide with recessions. With no recession on the (short term) horizon and no sign of a pick-up in inflation we remain in a sweet spot of economic growth driving earnings growth and earnings growth commensurately driving an equity bull market. Today’s high valuations mean we are (and were last year) reluctant to have too many eggs in the equity basket. However, the eggs we did have were geared towards higher risk, higher reward regions that would benefit from a pick-up in global growth. This proved to be right in 2017 and we are sticking with it for the start of 2018. Of course, with hindsight, we should have just put it all in equities (or, better, Bitcoin of which more later) and closed our eyes. But part of our job remains controlling the amount of risk we take in equity markets for our clients. Within these limits we were happy with how we did. Our focus on regions which were more geared to the global growth upswing such as Asia (including both Japan and China) and continental Europe. Many of our investments in these regions generated double digit gains for the year. An equity book which was broadly positioned in the right economic regions and other investments that, as a group, met their return targets meant that 2017 was a solid year for client returns. We have described before that this environment of solid global growth, low interest rates and subdued inflation is “just right” for investment markets. However, nothing lasts forever. As with Goldilocks’ porridge, we will have a problem if things turn too hot (inflation, rising interest rates) or too cold (slow down and possible recession). As we have been writing about this theme for a while now, what new news was there in 2017 which made us revise our view of which scenario looks most likely? The first point to make is that, as we stand at the beginning of 2018, the global economy continues to look “just right”. 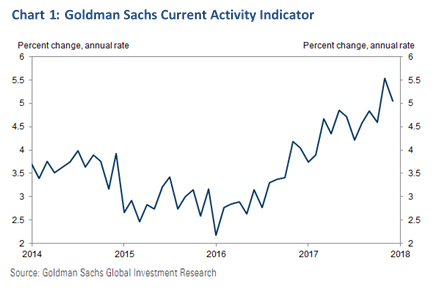 Goldman Sachs run a Current Activity Indicator which attempts to estimate today’s global growth rate by looking at the latest economic release as well as forward looking survey data which we show in Chart 1. Global growth remains on an upswing and is now tracking 5%. This is a big jump compared to a reading of below 3% seen in 2015 and the first part of 2016. There is also a coordination effect at play: stronger growth in Europe helps the UK economy for example. Growth in China helps the US and, these days, vice versa. A coordinated global upswing is built on more solid foundations than one off recovery stories. If growth is solid, what about inflation? Here we need to be careful to differentiate between the effects of one-off price changes and sustained, accelerating price inflation. As an example, when Brexit was announced sterling fell by around 15%. This has led to a rise in import prices and has pushed UK CPI inflation to over 3% (Mark Carney letter writing territory). These price rises are, however, one-off in nature and as they wash through the system we should expect inflation to fall back to its trend of 2% or so. Similarly, rises and falls in the oil price can cause inflation to spike and even (as it did in the UK in 2015) turn negative. This does not mean the economy has an inflation (or deflation) problem. Instead, to see a sustained pick-up in inflation we need to see an economy that is running too hot with too much money chasing too few goods. Where does this money come from? Remember, 65% to 70% of the typical developed market economy is made up of consumer spending so a strong consumer is an essential part of this story. And this means solid and accelerating wage gains. 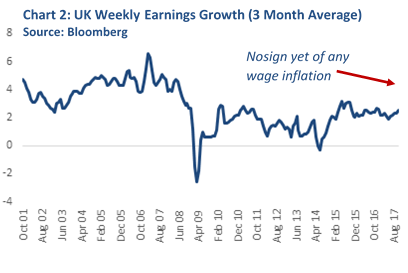 As unemployment falls and the labour market tightens there are good reasons to see this coming through but so far we have seen very little signs of any real wage inflation (see Chart 2 for the UK for example – the US shows a similar story). Chart 1 shows that the “too cold” slowdown scenario today is nowhere to be seen. Chart 2, however, shows that “too hot” with accelerating inflation has not yet arrived. This means Goldilocks remains in place and we are starting 2018 with very similar portfolios to those that broadly worked in 2017. One tempting thought is simply to bank the gains we have made for the last few years and wait for the next crash. Given today’s valuations, why be brave? The main reason we are sticking with our equity positions is that it is often in the last stages of a bull market that the highest returns are generated. Bubbles are defined by ever accelerating price rises but even in more normal markets there is money to be made near the end of the cycle. 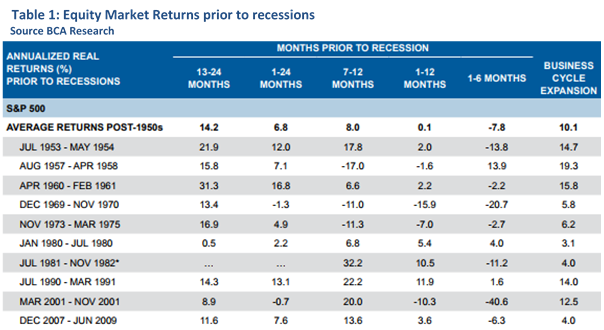 To illustrate this we show in Table 1 some research from one of our research providers, BCA, on equity returns in the months leading up to a recession. Today’s economic climate is positive enough that we feel pretty confident (absent a major shock) there will be no recession in 2018. With that in mind, Table 1 shows that even if the recession arrives in the first half of 2019 the chances are 2018 will start positively. The average annualised equity return 7-12 months before a recession is around 8% and since 1981 the return has been over 20%. Selling too early can be costly and, for now, we think the right decision is to stick with the equity bull market. It is rare that one gets to see a true bubble inflate in real time but Bitcoin and its associated crypto currencies are one such bubble. If nothing else, these sorts of (actually quite rare) market events display fascinating examples of investor psychology. Jeremy Grantham of GMO (an asset management firm) defines a bubble as “Excellent Fundamentals Euphorically Extrapolated”. The story of Bitcoin – a currency for our digital future independent of politicians and central banks – is the right one for right now. 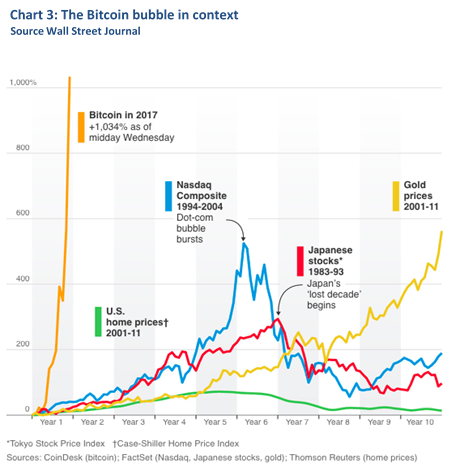 After a long period of gestation, euphoria is definitely in place: price rises for Bitcoin already exceed those of even the Tulip and South Sea bubbles (see Chart 3). For those of you hoping that we have profited from some of this move directly I am afraid to say we have not (directly at least). The reason we do not own Bitcoin is – rather like gold – it generates no revenues or income and so has no yield. 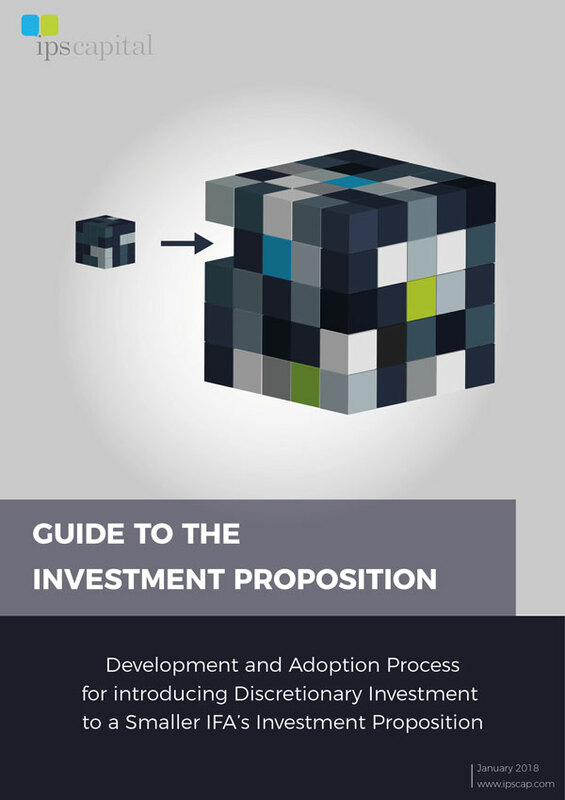 How do you correctly value an investment which generates no cash flow either today or at any point in the future? The answer is you can’t. The price could reasonably be £1, £100 or £100,000. All that matters is the story and that the price is rising. The only way you make money is if someone is prepared to pay for it more than you did. Today, no doubt, many such people exist. Rising prices and a good story are attracting more and more people into crypto currencies. This is a great example of what in investment jargon is called momentum investing. Rising prices creates positive news stories which pulls in more and more people and so creates further rising prices. Eventually, however, there is some bad news or you simply run out of new recruits. Prices fall, falling prices generate bad news stories, greed turns to fear and momentum runs strongly in the opposite direction. When this will happen is impossible to know (these processes are driven by investor psychology and network effects, not logic) but the existence of greed, fear and the momentum they create is a feature of nearly all markets. One of our areas of focus is on Absolute Return funds. These are designed to generate cash plus 3% p.a. or so with little or no reliance on rising equity markets to generate their returns. A good number of our absolute return funds (including, for example, Winton) rely mostly or in part on exploiting momentum (both up and down) in markets. Bitcoin aside, momentum was a strong factor in 2017. The FAANGs (Facebook, Apple, Amazon, Netflix and Google) added $800bn in valuation in 2017 alone helped in part by a weaker trending dollar. Our absolute return funds profited from some of these strong momentum moves. Though we do not own Bitcoin directly, we did make some money from Bitcoin like upswings and downswings and this was a material contributor of returns for the year. Although our overall equity positioning is broadly unchanged we are, of course, always evaluating new opportunities and adding investments which we find attractive. One area we have recently added to is global reinsurance. Last year saw a higher than usual series of storms (Harvey, Maria and Irma being the most notable) rip through the Caribbean and the US. This has led reinsurance markets to re-price higher and expected returns to rise. This is in vast contrast to nearly all other investment markets where prices rose in 2017 meaning lower future returns. At the end of 2017 we made a small allocation to a longstanding fund that invests in reinsurance markets and at the start of 2018 we will look to add some more as and when capacity becomes available. Our motivation here is twofold. First, after allowing for expected losses in reinsurance markets (the wind will, after all, continue to blow) we think that this investment should exceed our internal cash plus 3% return hurdle. Secondly, we have no special view on whether 2018 will be another year of hurricanes for the US. We do, however, know that the weather has no fundamental relation to equity market moves. Any investment that can generate the right return for our clients without relying on the ups and downs of equities is always attractive to us. The fact that prices fell in 2018 only makes it more so.